Are Cheap iPhone & iPad Chargers Safe? Who doesn’t love a good knockoff that looks the part? Sometimes we’re ok with that extra stitching or the way they spelled the label wrong – at least it was cheap! Or maybe not. Regardless, when it comes to your mobile devices, be careful when skimping on cheap USB chargers. At the least, they can fail or not work as you expected, at the worst they can destroy your device. Apple iOS devices charge via a proprietary Lightning Connector in the current models and older models used an equally proprietary 30-pin connector. While many companies sell USB chargers, not all chargers are created equal. In fact, they are often not sanctioned by Apple. “Why’s that a big deal,” you ask. Apple’s charger is £15, and I found one online for £5.” Or maybe you found a cheaper multiple device charging station for your iPads. Why’s it matter? The simple answer is that Apple takes their products very seriously. They are extremely careful about their vendors, and the products they make compatible with their products. Since 2013, they’ve even offered a replacement program for anyone using an unsanctioned 3rd party adapter just to stop their customers from potentially damaging their devices. “Recent reports have suggested that some counterfeit and third party adapters may not be designed properly and could result in safety issues. While not all third party adapters have an issue, we are announcing a USB Power Adapter Takeback Program to enable customers to acquire properly designed adapters,” says the press release behind the program. As part of the program, Apple will toss out the USB charger for you environmentally. They are utterly happy to throw it away for you. That says something of the danger. But what is the danger of using a cheap adapter? In a word, overheating. In most cheap USB charges, the voltage is either too high or too low. Taking a knockoff adapter apart also exposes that most lack the required insulation inside the charger. Meaning that the device itself can either get very hot (becoming a safety hazard) or be putting out the wrong voltage to your device causing irreparable damage to the connector and/or battery. Additionally, most knockoffs lack proper insulation, correct wiring and regulators causing safety hazards even aside from the potential damage to the device. Isn’t that worth the extra money? But, don’t take our word for it. Search the web for stories of cheap third-party adapters that have caused iPhones to burn up, to catch on fire, or just stop working forever. 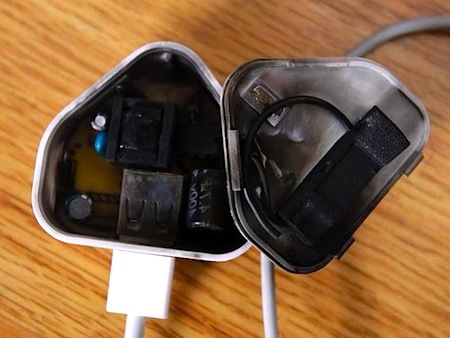 In Wandsworth, UK a woman was taken to hospital after her iFake charger exploded while she was on the phone. 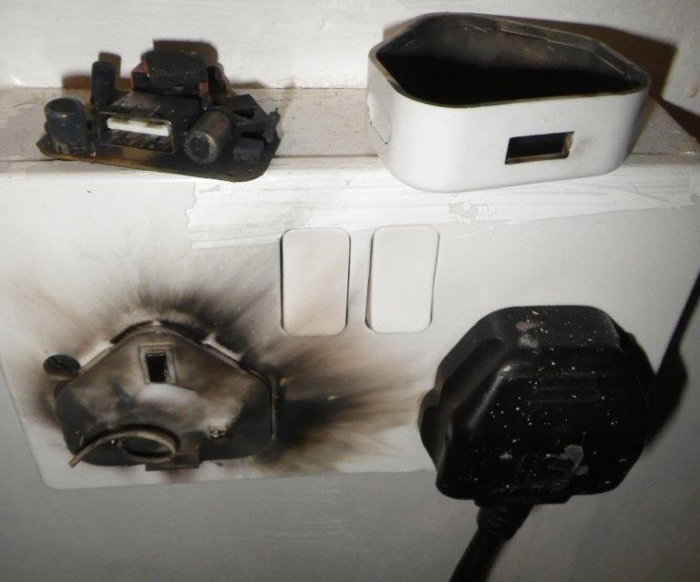 Fire investigator Andrew Vaughan–Davies said: “A dodgy charger has resulted in a woman being taken to hospital and unless people stop buying iFakes there will be more incidents and it’s only a matter of time before we are called to a fatal fire. “Genuine chargers may cost more and you may think you are only paying for the brand name, but you’re actually buying peace of mind because you know the charger is going to be of better quality and specifically designed for your phone. Our recommendation? Go the extra mile, and be sure your next charge is a lasting one. If you’re responsible for keep large numbers of iPad, tablets or phone charged in your school or business. Consider using an USB Multi Charger Station like the Chargebus 1050 which meets all health and safety and USB battery charging safety regulations. Making it a safe place to charge multiple mobile devices. Contact us for more information. Apple Products have had an interesting relationship with USB products in years past. From the days of their introducing FireWire in their machines as a replacement for the USB hardware to completely circumventing it by inventing their own Lightning Connector. Apple has a long found a way to work around the slower transfer speeds that USB 1.0 and 2.0 had in the past. Very silently, though, their latest iOS powerhouse device – the 12” iPad Pro – has been found to offer USB 3.0 support through the Lightning Connector. Why is this significant? Consider the older technology. Though the Lightning Connector has been around for a while, the other end of the cable is a standard USB 2.0 plug. USB 2.0 taps out at a theoretical 480 Mbits per second. USB 3.0 has a theoretical data transfer speed of 4.8 Gbps per second (or 4,800 Mbits.) Get the picture? It’s fast. However, you’ll need an adapter of some sort to make it a worthwhile change. Since the tech blog Ars Technica broke the story in November, there hasn’t been anything on the market to actually utilise this new capability in the iPad Pro, until now. Apple has upgraded support in their SD Card Reader for iPad to handle USB 3.0 speeds, meaning that you’ll be able to transfer pictures and videos to your iPad Pro much faster than before. The jury is still out on what further technologies could be made available. As noted, the real benefit to USB 3.0 is the upgraded speed of transfer. So, while it’s only good for transferring pictures from an SD card to your iPad faster right now, there is potential that it could also make syncing with iTunes, your computer, or other peripheral devices faster as well. It also means the way that data transfers from the tablet to devices. Think a smoother recording via AmpliTude for guitarists, faster uploads to your school computer’s image editing or video editing software, and a faster copy of large iOS updates from Apple Configurator. Either way, as more technology becomes available, faster is always better. In 2016 Onefruit will release USB 3.0 versions of their popular Chargebus Multi Chargers. Apple CEO Tim Cook famously bashed the Microsoft Surface when the first generation device was released by challenging the philosophy behind the device. Microsoft pushed it as a device that could replace your laptop. With the new Microsoft Surface 4, they took that one step further by installing the desktop version of Windows into the mobile device. When Apple announced the iPad Pro earlier this year, the 12.9” tablet drew comparisons to the Surface, and rightly so. At that size, it’s the size of most of Apple’s MacBook line, and only a few hundred grams lighter than the MacBooks. So, is it the tablet that can replace your laptop? Rather than replace, the iPad Pro certainly seeks to make your forget about it. The real difference is Apple’s decision to stick with iOS on the device, rather than scaling down OS X. The larger real-estate on the screen dose make using just about every app better. Add in new iOS 9 features like Split Screen and productivity takes a boost. The new stereo speakers (the first iOS device to have stereo instead of mono speakers) really shine by using a new feature that adjusts the balance of the audio depending on how you’re holding the device. In the work-room, presentation, home office and education settings, the mobile device has great potential. Reviewers are singing its praises. However, it’s not without its failings. At 12.9” many reviewers say the device is not comfortable to hold one handed. This may make walking and taking notes a little difficult. Too, you are limited to the range of iOS apps, which while expansive doesn’t always compete with its desktop versions of apps. Additionally, the pricey iPad Pro smart keyboard ($169) and iPad Pro-only pencil ($99) are sold separately. While the device is making headway with Apple fans, and has businesses and schools looking at the possibility of using it, the extra price point may be a hard sell for early adopters.